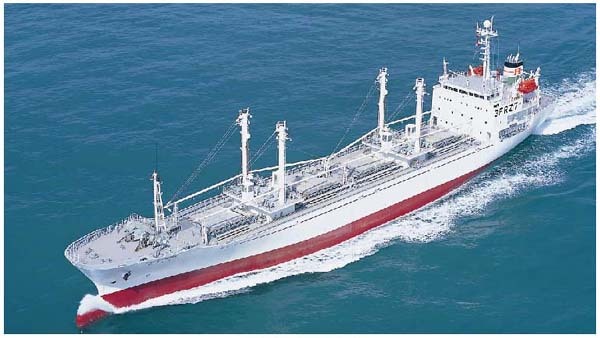 The YAKUSHIMA is a 217,850-cft refrigerated cargo carrier delivered in September, 1997 to Star Navigation S.A. at the Shin Kurushima Dock-yard Co., Ltd., Hashihama Factory. 1. The cargo space is divided into four cargo holds with eight insulated compartments and control air system in each cargo hold is provided in compliance with the requirements of Classification Society for the notation of RMC*. 2. For refrigeration, a direct expansion system includes five R-22 screw compressors, two condensers and two receivers. Air coolers with circulating fans are installed in each insulated compartment. Cold air is supplied via a floor duct into compartments and back to the coolers. 3. Cargo space temperature can be controlled between -50℃ and 12℃ with an accuracy of ±0.1℃. 4. The vessel has four derrick booms for handling of pallets.